The 5 Year Financial Plan for Excel supplies ten ready to use integrated financial worksheets with guide notes and demonstration data included (optional), to build your five year sales, cost of sales and company expense forecasts, create share issue plans and capital purchase budgets over the five year period. FastPlan PRO brings all your plan data together in a simple one step seamless process to create five year balance sheets, profit & loss and cash flow forecasts. 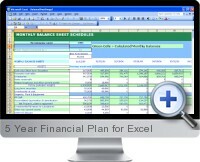 FastPlan calculates year end inventory levels, working capital, depreciation charges, depreciation charges, tax calculations, financing charges on debt, short and long term loan payables at each year end and forecasts year end bank balances to provide a completely worked out and balanced 5 year business plan. The 5 Year Financial Plan for Excel calculates all major and significant financial ratios for each 5 year plan, including earnings/share, net assets/share, return on assets, return on shareholder equity, return on invested capital, current ratios, quick ratios, debt ratios and interest coverage. New addition of an extra starting (prior period) balance sheet for swift calculations of changes in working capital, fixed assets and financing for the first year of the plan. Prior period balance sheet can be zero for new ventures.